This beautiful championship layout was built on the site of a former rice plantation. The course was sculpted out of gently rolling terrain, with heavily wooded areas that offer five sets of tees to accomodate golfers of all abilities. A taste of Scottish design, punctuated with natural wetland areas and fresh-water lakes, makes this unique course a distinctive, and enjoyable experience. 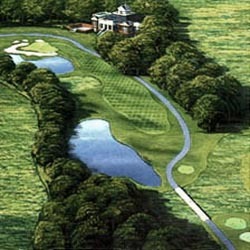 The course is the site of the LPGA Susan G. Komen International Golf Tournament.